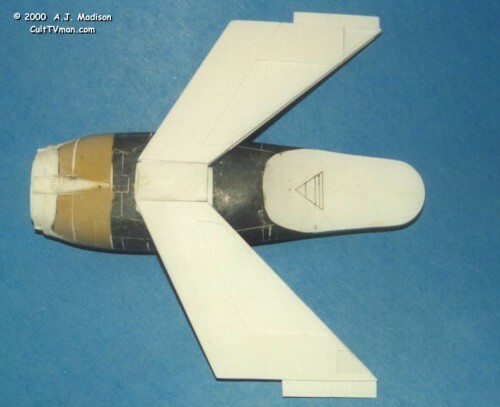 This week we present a Strike Cruiser from A.J. Madison. The bottom of the secondary hull shows the warp-nacelle pylon attachment pad and the longer, shallower fantail cutout. I spent alot of time drafting out the shape of the cutout (it started out as a piece of flat evergreen) and the support pieces under it. 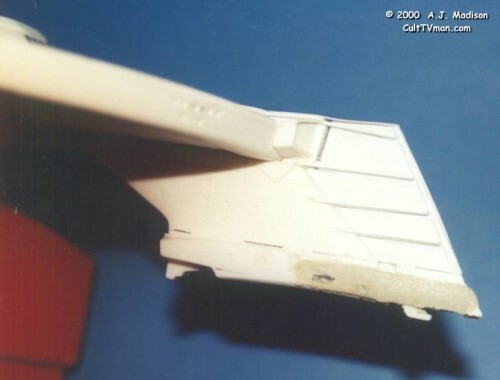 The lower sides of the shuttle bay are styrene sheet since they are both straight and flat. Here is the main deflector nearing completion. In the very center is what’s left of the original kit part, cut into an eliptical shape. 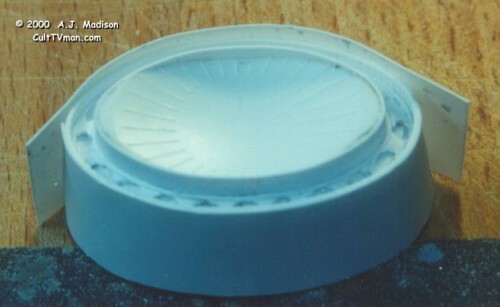 Various layers of sheet styrene surround the kit part, like an onion, producing the “ring of lights” channel. The light indents were produced by lining up twenty or so tiny “I” shaped pieces of plasticard on an eliptical ledge attached partway “up” the deflector. The picture shows the last piece of sheet being applied. Since its the top, it hangs over the main deflector somewhat like a baseball cap visor. The excess on the sides will be marked and trimmed to match the lower half arc. Scrap will back the join and superglue will be used to fill the tiny gap. Another major element of the Strike Cruiser is its stretched “neck”. In this picture, the photon-torpedo deck has been lengthened with epoxy putty, and the rear fin has been extended and braced for a covering of ten thou sheet styrene. If the braces appear sloppy, that’s because they are. The ribs were installed relatively haphazzardly, because they’ll be covered up by a plasticard “skin”. The styrene sheet covering will be blended into the impulse drive mid-line separator and the edge of the sheet faired into the kit part with accelerated superglue and putty. Wanting to visualize the final results, I test fitted all of the major components, minus the port warp assembly. 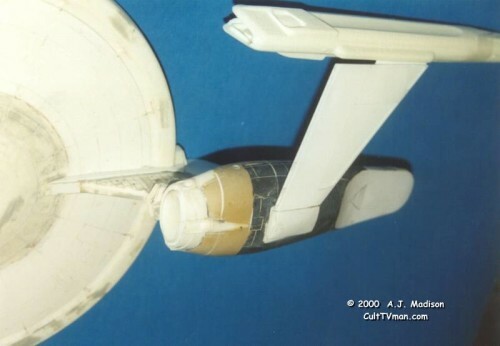 The modified interconnect has been attached to the secondary hull, and a kit warp nacelle dry fitted to the pylon. Alas, the kit part and the pylon need additional refinement to close the gap and to align the nacelle vertically, but nothing a No. 11 blade can’t fix in a few minutes. But otherwise, this Strike Cruiser will soon be needing a coat of paint.